Now that it has come to light that Sarah Palin hired her own Lobbyist to work on the Bridge to Nowhere and other Pork Projects for Alaska, it might be a good time to refresh our memories on what the guy at the top of the ticket had to say about her pet project. 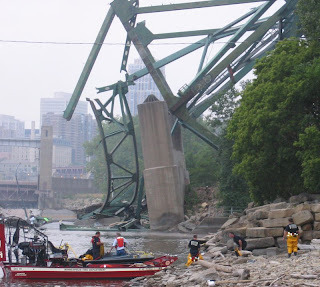 Just last month, presidential candidate Sen. John McCain, R-Arizona, said pet projects could have played a role in a Minnesota bridge collapse that killed 13 people earlier this year. "Maybe if we had done it right, maybe some of that money would have gone to inspect those bridges and other bridges around the country," McCain told a group of people in a town-hall style meeting in Ankeny, Iowa. "Maybe the 200,000 people who cross that bridge every day would have been safer than spending $233 million of your tax dollars on a bridge in Alaska to an island with 50 people on it." So John McCain thinks that Sarah and the Alaskan Republican party contributed to the bridge collapse in Minnesota! Really! Now that is news. I wonder if any of the media will bring it up this week? yeah.right.